Before Defence Minister A.K. 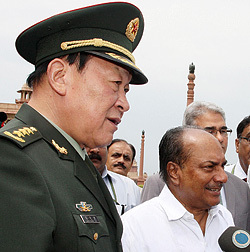 Anthony met his Chinese counterpart Liang Guanglie, New Delhi reportedly asked Beijing to limit its footprints in POK. Not that China will pay any heed but it is a beginning. It would have been equally good not to restrict Tibetan students during Guanlie’s visit. Why bend backwards when Zhang Yan, Chinese Ambassador, tells an Indian journalist to “shut up” when asked why Chinese maps depicted entire J&K as Pakistani territory”. Guanglie’s poser that China is concerned about US build up in Asia-Pacific should be seen in the light that once China deploys SLBMs’ with second strike capability and deploys a carrier group in Hainan coupled with weapons in space and cyber capability to kill critical networks, US may find it a problem to defend Taiwan with China’s AA/AD (anti-access/area-denial) strategy. Forget the cliché that the West wants us to have a war with China. The fact is that when China wants to attack us it will. The hype about Guanglie wanting to upgrade military ties with us could be the perfect ruse, his visit more likely to assess first-hand the mood in India. The fact is that the PLA is getting more and more say in foreign policy, control of CCCP is shifting shortly to hardliner ‘princelings’ and the generation five years hence will be even more assertive. The 1962 invasion was timed to coincide with the Cuban Missile Crisis. Next conflict with India maybe timed with another US engagement in the Middle East, attacking Taiwan. Or conflict in Asia-Pacific. PLA wanting good relations and the communist hierarchy not listening to them is bunkum; stapled visas issue, denying visa to Northern Army Commander, sportsmen from Arunachal etc. Surprise, deception and pre-emption have been hallmarks of Chinese strategy. The US strategy of ‘Asia Pivot’ was perhaps foreseen by China much earlier and counters established by way of North Korea, Pakistan, Iran, Libya, Syria, Sudan, Yemen and Somalia. China’s peace homilies are exposed with her training, arming and advising the Taliban how to fight in Afghanistan, supporting Pakistan’s anti-India jihadi policy, providing sanctuaries/training/arming ULFA, supporting Nepalese Maoists and now arming our Northeast terrorist organisations including Maoists. China’s increasing encirclement of India and claims to more Indian territory does not imply China will never attack us. 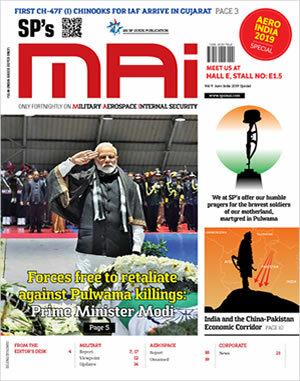 We would be naive if we can’t see through the gains that China will have through demilitarisation of Siachen while already sitting in POK (Gilgit-Baltistan), Aksai Chin and Shaksgam. It is foolish if we do not recognise multiple indicators that China and Pakistan want to balkanise India. We fought a superior enemy in 1962 not because of its size but because we lacked strategic forethought, could not read the enemy, had poor political and military leadership and had an army that was armed, equipped and trained very poorly. What we must do is dispassionately appraise our state today with that of 1962. 21st century wars are quite different from those of 1962 era. Both China and Pakistan have been waging asymmetric wars against us for past several years and we are yet to develop deterrence even against irregular forces. Any future conflict with China will not only witness an ‘informised’ PLA in action with optimum use of rapid reaction forces (including third dimension) and network-centric warfare but fully activated domains of space, cyberspace and the electromagnetic. Cyber attacks to kill critical networks and multiple missile and EMP attacks coupled with laser and plasma weapons can be expected. Use of tactical nuclear weapons should not be totally discounted. We may not have matching economy or military forces but we must focus on hitting the enemy critical areas conventionally, unconventionally and asymmetrically.